This week’s Blog Cruise Question asks: What are your favorite resources for the ages and grades that you are teaching? I’ve decided that I want to explore my favorite resources for Language Arts. Language Arts as a subject might better be expressed as the Art of Communication. As a subject LA strives to teach the skills necessary for communication. We can categorize these skills into two very broad areas: Receptive and Expressive. Within receptive language skills we find reading and listening skills. Forms of expressive language skills include writing and speaking. For years I’ve tried to find a comprehensive Language Arts Curriculum that covered all the skills my girls needed to communicate effectively. After 14 years, I still haven’t found the one single LA program that “does it all” in a way that works for us. Instead, I’ve found that it has really helped to break down those skills and then seek products that work best for my family to teach those skills. Some areas like vocabulary cross the boundaries of not just skill areas, but subjects as well such as science. Although I do have the girls learn subject specific vocabulary, I do like having something that teaches vocabulary in a general way that would improve language skills. Thanks to the Review Crew, I’ve discovered Vocabulary Cartoons. For teaching middle and high school students, I really love using SAT Word Power. It’s not been the only thing we’ve used for teaching vocabulary, but it is my current favorite! Spelling has been the bane of my existence or the thorn in my side, at least with my oldest daughter. Spelling is the flip side of reading. When reading you are decoding symbols, and with spelling you are encoding symbols. A friend of mine loves All About Spelling so much that she finally convinced me to try it. Oh how I wish I had discovered this years ago to use with my oldest daughter. AAS is my favorite spelling program for teaching spelling at the elementary level. Supergirl loves it! Being able to write well starts with actually being able to form letters. I love Handwriting without Tears. It was written by an Occupational Therapist and teaches penmanship from a developmental aspect. I have used HWT with all four girls and I have to say that we have had no tears! Other skill areas include reading, writing and speech (both making and giving speeches). I really haven’t found a “teach how to read” program that I love. I have taught my girls to read and 3 of them read really well. The 4th has neurological issues but she *is* reading short vowel words like cat, mad, pig, etc. And writing? I’ve really struggled with teaching writing. My Access has been wonderful for helping the girls to organize their thoughts before writing and to work through the re-writing, editing and revising aspects of writing but I haven’t found a product that screams: “This is it!”. I’m very happy with My Access and you can read my review for my thoughts. I really do wish I had discovered the single comprehensive product that would cover, reading, writing, penmanship, vocabulary, grammar, speech and anything else I’m sure I’ve forgotten. For now though, I am just thankful that I’ve been able to find some pieces and parts that have worked really well for my family. What are your favorite resources for Language Arts? You can click below to read the my Crew Mates’ answers to this week’s Blog Cruise. Today is the Sunday of the Exaltation of the Cross. One year ago, on the Sunday of the Exaltation of the Cross, I attended my very first Divine Liturgy in an Orthodox Church. I knew that theologically, I needed to be Orthodox. The whole concept of Theosis just resonates within my soul. I had come to realize that my view of salvation was Orthodox! I was saved. 2,000 years ago Christ suffered on the Cross so that I could be redeemed. My faith has made me “right with God.” I am being saved. Right now, I am being conformed to the image of Christ and I strive to be more and more like Him. Lord have mercy, I will be saved when I stand before Him and behold His glory! But even though I my heart sang with joy at the discovery of Theosis, my mind struggled with such things as icons and incense. I knew I had to *experience* Orthodoxy. Silly me, I thought that if I could experience Orthodoxy, I would “get it out of my system” and be able to return to my safe little world. This morning I realized that I have come to love the smell of incense. I have come to love the beautiful icons, and crossing myself has become second nature. Today as I worshiped I realized that it had meaning for me and it was an expression of my love for God. A year ago, I couldn’t comprehend lighting a candle or venerating an icon and I certainly felt out of place as everyone around me prostrated before the Cross. But this morning, I lit a candle, and, with love and gratitude for my Savior, I venerated several icons. I even did my own (modified because of bad knees) prostrations before the precious, life-giving Cross. I cried out to God and I told Him that if He wanted me to be Orthodox, He was going to have to work in my heart, and He did. There is still so much I don’t know and still so much I don’t understand but I am willing to follow Him and see where He takes me. Through Orthodoxy, I rediscovered my love for God and have come to a deeper understanding of His love for me. I have a richer, more meaningful to me, spiritual life than I had before. I’ve learned that seeking after God with everything I have can take me down paths I never even knew existed. It’s been a wild ride of a year! Near the beginning of the Cruise year, our wonderful Vendor Liaison, Brenda, posted a list of upcoming vendors. I saw New Monic Books on the list and I waited in anticipation for the list of names to be posted. I knew that I had at least one daughter who would devour this book! There were cheers from everyone in our house when mommy found her name on the list. Turtlegirl is my language girl. She has always had a love for words, so it was no surprise to me that she disappeared with the book moments after it arrived. I heard her giggle and laugh. Vocabulary Cartoons: SAT Word Power ($12.95)from New Monic Books is not just entertaining; it’s educational. While giggling and laughing, Turtlegirl, along with her sisters, increases vocabulary knowledge. The book also helps to expand writing skills as the girls seek to out do each other making up sentences with the words. How does Vocabulary Cartoons Work? Vocabulary Cartoons uses mnemonics, a device used to help you remember something by associating it with something you already know. The website has a detailed explanation of how Vocabulary Cartoons uses mnemonics which you can read here. Each page focuses on one word and includes the definition, a link word, a cartoon with a caption, and several sentences using the word. You can see samples of the cartoons here and here. Reviews are included after every 10 words. 10 matching and 10 fill in the blank with an answer key in the back of the book. I had my children write their answers on notebook paper and I used the reviews as quizes. I appreciate that New Monics Books includes the pronunciation of each word with the definition. I didn’t have to guess, or struggle or put the book down and go to another source to find the proper pronunciation. You can view a complete word list for this volume by clicking here. We used this in a group setting rather than having each girl work through it independently. This accomplishes two things: makes sharing easier, and we get to have fun together. We used Vocabulary Cartoons 2 to 3 times a week covering 3 to 4 words in a session. Because I am the mom, I get control of the book. I would sit in my rocking chair and the girls would sprawl over the couches or floor or like this morning, Tailorbear preferred to be upside down (I really should have taken a picture!). After reading the word, the definition, and the link word, I flip the book around to show them the cartoon. Whoever is closest to the book gets to read the caption to all of us. I then read the sentences to the girls. When we’ve done this for 3 or 4 words, we then review words from previous sessions. Sometimes I’ll call out the word and they give me the link word and definition. Sometimes I’ll call out the link word and they give me the vocabulary word and the definition, and just because I have to change things up, I’ll sometimes call out the definition and ask for the link word and vocabulary word. Doesn’t sound too exciting or fun does it? But wait, now we get to the fun part! The girls and I then start to make up sentences using the words we’ve learned so far. Some of these sentences get rather silly but the sillier the sentence the better for remembering the definition. Lately, the girls have been watching the BBC’s Robin Hood. Supergirl is almost obsessed with Robin Hood. Robin Hood inspired many sentences. Throughout the day, we continue to make up sentences when possible to use those vocabulary words. I am so impressed with this book that I am putting the Elementary Edition (be sure and watch the Cruise Blog for an upcoming review from some of my fellow crewmates) and the Vocabulary Cartoons II SAT Word Power on my wish list. This has been an easy and enjoyable way to include vocabulary studies in our home school. At first glance a cartoon book to learn vocabulary doesn’t seem educational enough, but when using the review pages included as quizzes, two girls got 100 % and one received 90% (18/20). It works. Not only are my children learning vocabulary, but I am learning new words as well! Click below to read what my fellow crew mates have to say about Vocabulary Cartoons SAT Word Power. Disclaimer: As a TOS Crew member, I received Vocabulary Cartoons SAT Word Power free of charge so that I could provide my honest review. I received no other compensation. Does Mom get free time too? It’s Blog Cruise time again. This week’s question is How do you find free time? Is it okay to take time for yourself? If so, how? As I ponder these questions, I can’t help but answer “it depends.” Is it okay to take time for yourself, yes, but how and when, are going to depend on a lot of factors. I know when my girls were little I really struggled with whether or not I was being completely selfish for thinking I needed a break. I love my girls. I enjoy being with them. I was haunted by the words of a mom of many. She and her husband came by themselves to bring us a dinner when my 4th baby was born. I made the comment that it must be nice to get out without the baby (their baby was a few months older than mine) and she responded with something like “I like being with my children.” She was older than me; she had more children than me. Surely, she must then have more wisdom and clearly I was missing something. But was I? I didn’t mean nor did I imply that she didn’t like being with her children or that she didn’t like her children or that she was a bad mom, but it was a compliment that having older children to watch the baby for a few minutes must be a blessing. Still I wondered, was I wrong to want to think I needed some time without the children? Was there something wrong with me? Was there some character quality that I was lacking for thinking a few minutes without my child would be refreshing? No, there wasn’t anything wrong me. Through the years, I’ve come to believe that the woman didn’t mean to chastise me with her words so much as to assuage any guilt she might have been feeling at leaving her young baby home with her teen daughter. Are there selfish moms out there who put themselves before their children? I’m sure there are but I’m also equally sure that needing some free time does *not* make you a selfish mom. So what does free time look like? Well when the girls were really really little it sometimes looked like a nap for the girls while I played on the computer. Or it meant the girls playing with daddy for 1/2 an hour so I could clean the kitchen after dinner without interruption. It may sound strange but I really treasured that 1/2 hour even though I was cleaning. No little person demanded to nurse or asked a “why?” question or needed a diaper change or tried to “help” in that preschool not really helpful way. Sometimes free time looked like Daddy taking 4 girls to do errands so I could do whatever I wanted. He didn’t do this often (taking 4 little girls out by oneself is no easy task especially when one is the daddy and not the mommy!) but he did it when I needed it. Usually, free time meant getting up before the girls. This required balance though because if I got too much time before they were up, I found that I lacked the self-discipline to stop doing what I wanted so that I could do school with them and I would find myself resenting them for intruding into my time. I discovered that there really was such a thing as too much me time. Now that that girls are older, my time or my free time doesn’t necessarily require “alone time”. It doesn’t require sending the girls with daddy or leaving them at home and I leave without them. We attend a Bible Study twice a month. It’s kind of like free time for me. The girls are there but they are either participating in the study or they are in the playroom. I get to have stimulating adult conversation and I get to not feel guilty about leaving my girls because they are right there with me. I found that what free time means or what it looks like is a reflection of what I need or where I am at. Whatever it is that I need to “fill the tank” so that I can keep giving to my family is what I find myself doing for free time. Having a clean house makes me feel good. Being organized makes me feel good so sometimes my free time is “working” but it satisfies me and gives me that “alone” time I need. If you find yourself resenting your children, take a look at free time. It may be that you don’t have enough but it could also mean that you have too much and you need to find the balance. Having free time is a necessity and do not let any one make you feel selfish because you need to be without children every now and again especially when you are both mom and teacher. The TOS Crew Blog sponsors a “Question of the Week” every Tuesday. Check out what my fellow crewmates have to say about this week’s question. Though my daughters seem to thrive in social studies and language arts, they do not all thrive in mathematics. The longer I home school the more I appreciate the need for supplemental math programs, so I was excited to receive a 2 month online subscription from America’s Math Teacher. What is America’s Math Teacher? America’s Math Teacher is online math education developed by the same classroom teacher that created the award winning Math Essentials workbook program. For $195 America’s Math Teacher offers one year access to their web based program. The heart of the program is located in the Learning Center which offers 4 levels or courses: Basic Math Course, Advanced Math Course, Pre-Algebra and Algebra. Students watch video lessons from the Learning Center and follow up with practice by using written exercises that you can download and print. Advanced Course- “This course is designed for middle grades students, but is also excellent for older students who have weak math backgrounds”. America’s Math Teacher is not an interactive, all-in-one curriculum. It does not provide feedback to the parent or teacher on the progress of the student. It is not automated. This means it does not assign work to your student, track it or move your student to the next lesson; it is not individualized in this way. We found the format of the speed drill confusing and prefer a more traditional approach to speed drills. When first checking out the website, I planned on evaluating my girls to see where they were weakest and choosing video lessons/written exercises to focus on improving those weak areas. I had planned that my oldest would work mostly in the Algebra course and perhaps a bit in the pre-algebra course. There is an evaluation tab that contains timed quizzes and a final exam for each course (disclaimer: at the time of this writing, there are no quizzes or a final for the Algebra Course, I know that AMT is still adding to and improving the website and I fully expect that there will be quizzes and a final added for the Algebra Course). The website for America’s Math Teacher is a work in progress. Instead of giving the girls quizzes to use as placement tests (those quizzes were not yet available), I had the girls work with America’s Math Teacher for 15-20 minutes daily. I let the girls decide what topics they wanted to cover. TailorBear mostly chose topics from the Advanced Math Course. She would pick a topic based on a weakness or an interest and watch the video. Then I would print the corresponding written exercise for her to complete. She enjoyed having a fresh view to some old concepts and picked a few that had not yet been covered in her spine program but that interested her, such as geometry. She needs the discipline though of a more directed approach, but I do believe it did improve her attitude towards math in general and that is a good thing! This product is really over Supergirl’s head but she did not want to be left out! I let her watch the first few video lessons from the Basic Course. If nothing else, it exposed her to the concepts, but more importantly it made her feel good to be like her sisters. I think the one daughter that would really thrive with this program is Turtlegirl. She is more independent and self-disciplined than her younger sister so worked more systematically through the lessons. She worked with mostly with the Pre-Algebra. Turtlegirl needs more of a “spiral” approach to math and I think America’s Math Teacher provides that for her. Though America’s Math Teacher stresses mastery of the basic math skills needed, the approach is more spiral from course to course. For example you will find whole number topics like adding whole numbers and subtracting whole numbers in both the Basic Course and the Advanced Course. Each time the concept is presented, the topic is explored with more depth. Other mastery approaches focus on one concept such as adding whole numbers until mastered and then moves on to the next concept. This approach works well for many students but not necessarily for Turtlegirl. The approach of America’s Math Teacher is a better fit for Turtlegirl and the format of the website allowing her to move from course to course at her discretion means that if she wants to go deeper now with a topic she can. If a topic is slightly too advanced, she can backtrack to a lower course to get back up to speed. Flip the coin to the other side and we find BooBear. She likes to really sink her teeth into a topic and own it before being introduced to a new concept. In theory, America’s Math Teacher would be great for her to use alongside our spine. She could use our math spine to get her introduction to the concept and then work through America’s Math Teacher to really own the concept. Unfortunately, the Algebra Course does not have written exercises at this time. (I’ve been told by tech support that there will be Written Exercises for the Algebra course in the near future). We could not use America’s Math Teacher the way I would have liked but BooBear did use America’s Math Teacher to review concepts from Pre-Algebra. I can see this online math education from America’s Math Teacher to be an ideal program for students who are transitioning from home school to public school or from public school to home school. The parent or teacher can then be sure the student has the required math skills to move to the next level and that math skills are not lost during the transition. I can see this program being ideal for math loving students to use alongside another math curriculum allowing the student to feast on math. Families experiencing prolonged illness or crisis may benefit from America’s Math Teacher to relieve mom’s stress. The student can continue with math studies while the family recovers from illness or works through the difficult circumstances. I think this would make a great supplement for my Turtlegirl. $195 is a little to rich for my blood at this time, but I will be considering this program for Turtlegirl and Tailorbear when/if my budget allows. I’d love to see a monthly subscription option so that I could at least use it over the summer months to keep math skills sharp. America’s Math Teacher does have an option to try some video lessons and written exercises for free. If you think you might like the program check out the samples here. To contact America’s Math Teacher you can fill out this contact form or find your area rep.
Disclaimer: As a TOS Crew member, I received a 60 day subscription to access this website so I could provide my honest review. I received no other compensation. Recently, I blogged about the The TOS Planner. With this post, I want to share an update on how my planner set up is going. First let me refresh your memory about the TOS Planner with some excerpts from my previous post. In my previous Planner Post, I mentioned that I was setting up a mini-planner for myself. I decided not to do the comb binding but instead found a three-prong folder to use. This way I can set up a few months at a time. I will be able to add and delete much more easily. I will be making more mini-planners over time and I’ll be working with 3 of my daughters to create customized planners using the new TOS Student Planners that will be released this month. If you are expecting to find a post about how I’ve got all the answers and I can tell you how to cope and get through it, I’m afraid you’ll be disappointed. This is a post about me feeling the burn out and exploring in myself why I’m feeling burnt out and maybe discover what I can do to cope and overcome this debilitating state of mind. I’ve just invited you all to come along for the ride. It could be that I’m a perfectionist. I struggle with the difference between realistic expectations and expectations of perfection. While I know, at least with some sense of reasoning, that I can not do it all and that the more I have to do the less of me I can give, I just can’t seem to completely overcome the part of me that seems to think I should be able to do it all and do it all perfectly with a smile to boot. I’m also sure there is a sense of martyrdom looming on the edges . Being a parent is a 24/7 job and we’ve had the approach that home schooling is a way of life. That approach created a mom/teacher who would really really like the “work” part of home schooling to end by dinner time and for the work of school to disappear completely over the weekend. On the surface it would seem that the answer could be so simple: put the kids in school. But I don’t the answer is as simple as a change of location for their education. I think it is much more complicated and buried much deeper and I think it requires heart surgery to dig deeper. When the girls were really little, my house was cleaner. When the girls were little, school didn’t take all day. When the girls were little, we ate more home cooked meals. When the girls were little, I had my weekends “free” to enjoy my family. I think I have this unrealistic expectation that I should still be able to do what I did then when in reality they were not all doing school and 3 of them still took naps! It’s time I adjust my expectations to more closely match reality. It’s time to rebuild some habits that I’ve let slip away. It’s time to lay my heart at the altar and let the Master Surgeon do His work. As a home schooling parent I know that teaching my children can be a labor of love. The Old Schoolhouse Magazine is celebrating the Labor of Love with an extraordinary subscription deal. From now until Midnight PDT on September 15, TOS is offering home school families a one year print subscription for only $7.95 or choose the one year plus current issue for $12.95. The One-Year subscription begins with the winter issue whereas the One-Year Plus Current subscription starts with the fall issue. I am anxiously awaiting my copy of the fall issue so that I can read articles by Ruth Beechick, Todd Wilson and Molly Green. Each issue is packed full of information and encouragement and at this unbelievable price, I just might have to add another year to my own subscription. But we’ll need to hurry. The Old Schoolhouse Magazine only has 5000 special subscriptions available and they are only available until midnight (PDT) on September 15. Once the 5000 are gone they’re gone! Hurry and grab this crazy price today! When I saw my name on the list for the notification for this product, I literally shouted out loud! I was afraid I was going to wake the children because I was so excited. I had heard of My Access before and the more I heard the more intrigued I became..
My Access from Vantage Learning is an interactive online subscription that utilizes artificial intelligence to provide instant feedback to students. The students use this feedback to improve their writing skills. It is intended for students ages 8 to 18. The writing topics (over 100 of them!) are first divided by age groups: 8-11, 11-14, 15-18. The topics are further divided by purpose: informative, narrative, and persuasive. My Access teaches students to approach writing as a process. Each 12 month unlimited access subscription includes one parent-account and either 3 student-level accounts ($99) or 6 student-level accounts. ($129). How does My Access Work? I was given the subscription for the Home Edition for up to 6 students. I created a parent account for myself and then created an account for myself as a student. I then set up accounts for 3 of my girls. Why did I set up myself as a student? So that I could understand the program. I wanted to see how it worked. I wanted to know its standards for grading. Once she has reviewed her revision goals for this particular assignment, she clicks on the Assignment Tab, chooses the assignment and clicks resume to continue working on that assignment. One of the great things about having an online subscription is that you can log in on any computer with internet access. Here TailorBear works on My Access in the family room while BooBear was working on My Access in the dining room. When BooBear finished her work for the day, Turtlegirl jumped on for her daily turn. If you look closely you can see the My Access Loading on the screen. and then she reads the instructions. Eventually she makes her choice and begins the pre-writing process using the My Access tools to brainstorm and create an outline. So how does it work? It takes students step by step through the writing process giving feedback and instruction so they can build the skills necessary to improve their writing. What I love about My Access! My favorite feature is the My Editor tool. As the students write or revise their papers they have access to the My Editor tab. This tool analyzes their writing and provides clickable links with helps and suggestions for the student. For example, let’s say I misspell a word. My Editor puts a <spelling error> notation. Click the notation and it gives you some spelling suggestions. Perhaps you got carried away and wrote a run on sentence? It would give you a clickable notice. You would be given a reminder of the rule and a suggestion. Another feature I love are the pre-writing tools. The student can can begin their draft right away (not recommended) *or* they can choose to start the writing course which discusses the writing process and guides the student to the graphic organizer to plan their writing. I really like the ability to create My Topic assignments for my girls. I can create my own topic or I can use the “Topic Wheel” to create a topic. TailorBear and Turtlegirl enjoyed writing fun stories about dragons and cats from the Topic Wheel. My Access is more than just the My Editor. Students can learn and practice writing skills by completing activities. Activities are arranged by writing trait such as content development or focus. There are progressive levels for those activities such as Content Form A, Content Form B etc. Students earn points towards rewards by completing activities and submitting drafts of their writing. What I love best though is the reaction of my children. They love using the program. My oldest had been so discouraged in the past with trying to figure out how to revise and edit her papers and My Access has given her the tools she needed to evaluate her work. She was so impressed with the My Editor tool that she asked me to create My Topic assignments for her so she could revise several papers from last year. My Access appears daily on my girls’ assignment sheet. They know that they are to spend 20 to 30 minutes every day working with My Access. We are using My Access as supplement to our English and History curriculum. When they are given a writing assignment for English or History or any other subject, I create a My Topic assignment in My Access. When they do not have an assignment from our spine curriculum they are free to choose one of the writing topics already available or they may request to create one using the Topic Wheel. It sounds great! Are there any cons? Our biggest frustration with My Access with the My Editor tool. We love this tool but I would love to see an option for the parent/teacher to override some things marked as errors. Because My Access uses artificial intelligence to provide feedback, it is limited to conventional rules and spelling. This means that correctly spelled words not found in its dictionary are marked wrong. I would love to be able to add to the dictionary so that names would not be counted as misspelled. I think this program is awesome for students who like to write or who are able to write. I don’t believe it teaches writing so much as it teaches how to rewrite, revise and edit. I think if your student struggles with putting a sentence or a paragraph together, that this program may be frustrating. Turtlegirl is my best writer. Writing is what she plans on doing when she grows up. She wanted me to share that she thought some of the revision goal ideas and suggestions should be rewritten to provide more concrete help. She said some of the examples just didn’t apply to what she was trying to do and were not helpful. I love this program for my high school student. I think it’s awesome for my advanced in language arts 8th grader. I don’t know that my 6th grader is getting quite as much out of it as her two older sisters, but I am grateful that we have subscription for her as well. The program states that is for ages 8 to 18 or grades 4 to 12. I don’t think I would use this with a student below 5 or 6th grade. Overall I think this is an excellent program to teach students to work through the writing process and learn how to revise and edit their papers. Be sure and check out Vantage Learning to see all the products available for Home, School or Corporation including College Edition of My Access and Add on Packs for the Home Edition. Disclaimer: As a TOS Crew member, I received this 12 month online subscription to My Access! from Vantage Learning so I could provide my honest review. I received no other compensation. If you sign up to follow my blog with your email address you will receive blog posts. I do not sell, share, trade or barter email addresses. Email addresses are collected by Google Feed Burner for the sole purposes of distributing Circling Through This Life blog posts. 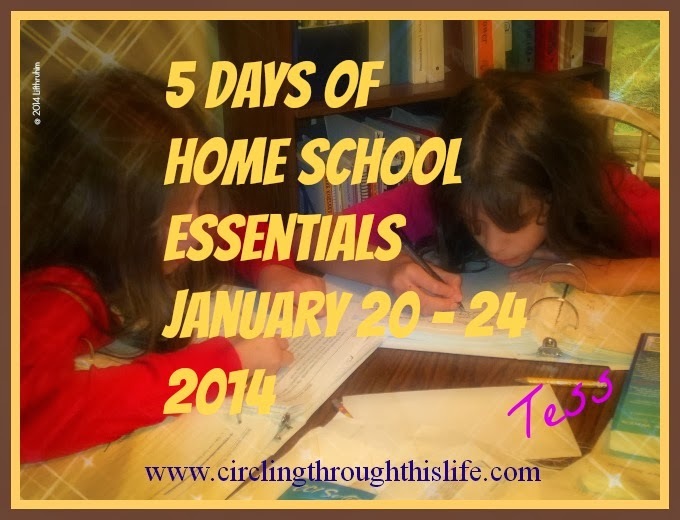 5 Days of Back to Homeshool! Content copyright 2009-2018 Circling Through This Life.com. Simple theme. Powered by Blogger.